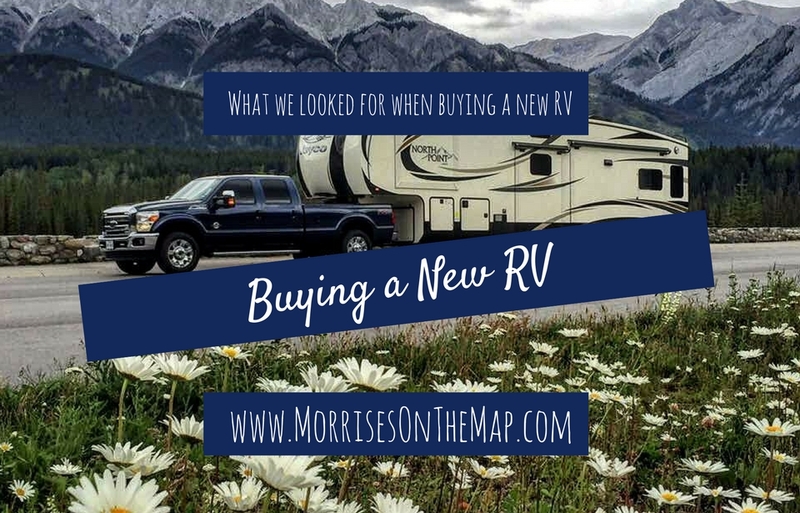 When we bought our first RV in February 2008, we thought we knew what we wanted in an RV. Blaine and I may not have ever owned our own RV, but we had spent a great deal of time RVing with family. It was not long after buying, we realized our list should have had much more on it. We loved our KZ Spree, but a few different priorities could have added to the longevity of that trailer with the growth of our family. So when it came time to buy a new trailer, we sat down and made a list of what we felt were our non-negotiables. There were several trailers we did not even look at as soon as we found out that it lacked certain features we wanted. Why waste your time looking at a trailer when you know it does not have one of your must haves? We are sharing our list of what we feel is important to us to help you create your own list. Not everything that was important to us will be important to you, but this will give you some things to think about. Keep in mind while reading this you may never find the perfect RV, and you may have to make compromises, but you should try to find the RV that suits your needs and budget best.  It is easy to get caught up with all the new technology going into RVs, or cool features, and forget what your most important needs are. And it’s easy to over-spend on an RV leaving little money to actually use it! Our first trailer had one outlet above the kitchen sink in the entire living area. That did not work for us at all! With camera chargers, phone chargers, coffee makers and other devices, having just one outlet was always a problem. So one of the first things we looked for were the number of electrical outlets and their locations. We would suggest to get as many outlets as possible. You will not use all the outlets at the same time (you probably shouldn’t even if you needed to) but at least there will be one you can use, close to where you need it. If you plan on cooking in your trailer and not always outside, then make sure you check out the counter space. 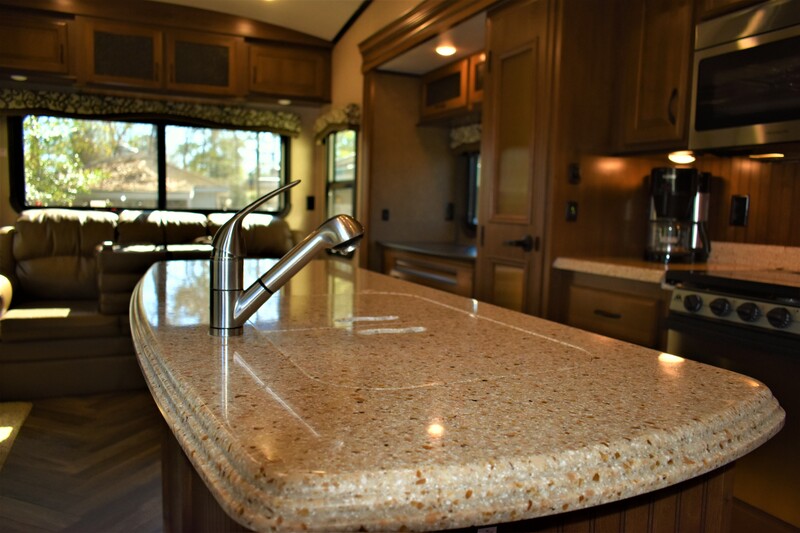 RV manufactures are doing a great job these days of creating floorplans that maximize the counter space. When traveling who wants to stop and go to the grocery store every few days? Having a place to put away a week’s worth of groceries was a must, and we did not want to use cabinet space to do so. 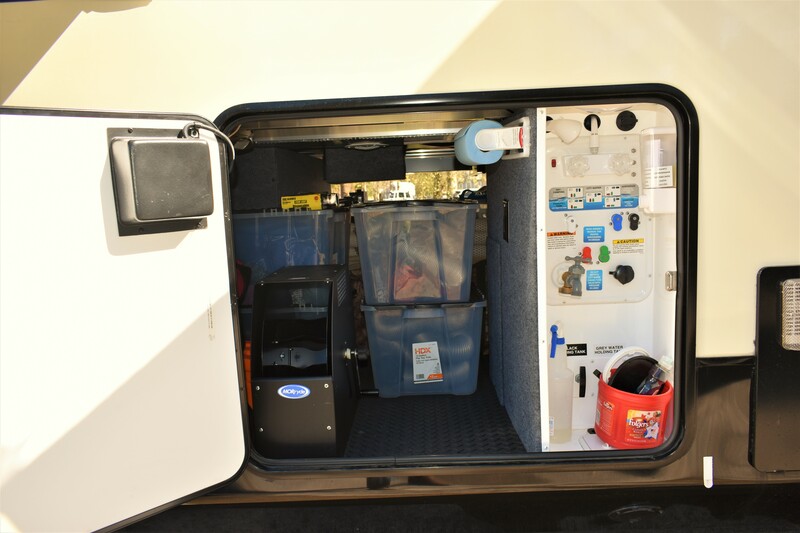 Many RVs do not have a pantry, and you are forced to put your groceries in different cabinets around the RV. Also, make sure the shelving is up to the task of holding the amount of groceries you pile on them. It may be necessary for you to beef up the support holding the shelves up, ask us how we know this! As kids get older they sometimes like to get away from mom and dad (imagine that). We wanted to give our kids a place where they could comfortably have some kid time, and we could have some adult time. We also have a daughter and a son. So when we found our Jayco 377RLBH with a loft above the kids bedroom, we thought this is perfect. They get a room to hang out in, but we also have two separate sleeping areas. Wrinkled clothes is a major pet peeve in the Morris Family, but, realistically, we do not want to iron clothes on vacation. So what’s the Laundry Attendant to do? Look for ample clothes storage space! We really wanted a separate place to hang our kids’ clothes to keep them from wrinkling. Christy would not even look at a trailer that did not have a closet in the kids’ area. If you do not have a problem folding all of your kids’ clothes, this may not be a must have for you, but it is something to think about. 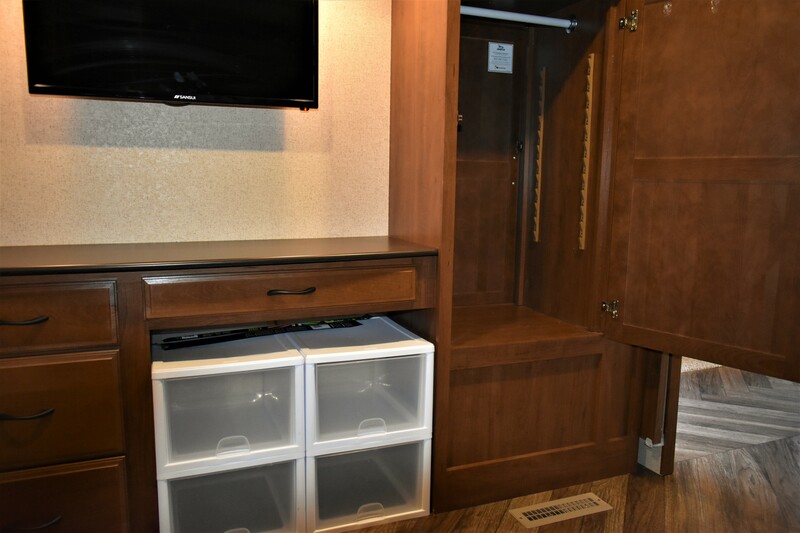 Certainly, closet space is something to consider if you are wanting to be a full-time RVer (more on that later!). 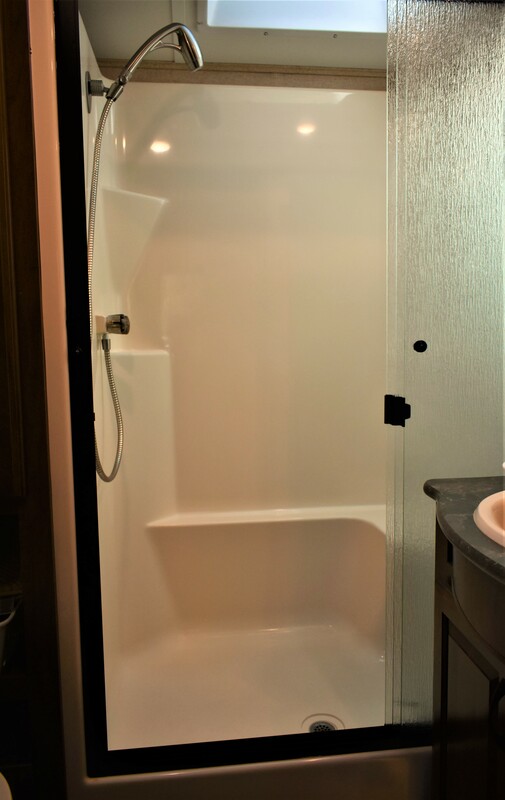 Our first trailer had a small shower-bath combo that was perfect for giving young kids a bath. Once the kids got bigger, the bath did not work out so well. So we decided to look for a trailer with just a shower. We also wanted to be able to move around comfortably and not hit an elbow on the wall while trying to brush your teeth or get dressed in the bathroom, so we looked for a larger bathroom than our previous trailer. We lucked out and our Jayco came with a full sized residential refrigerator. It is AMAZING! One of the places we camp is pretty remote and we try to bring a week’s worth of groceries. We would often have to put most of our cold food in an ice chest and have to buy ice throughout the week to keep it cold. Now we have plenty of room! There are some drawbacks to this setup though. 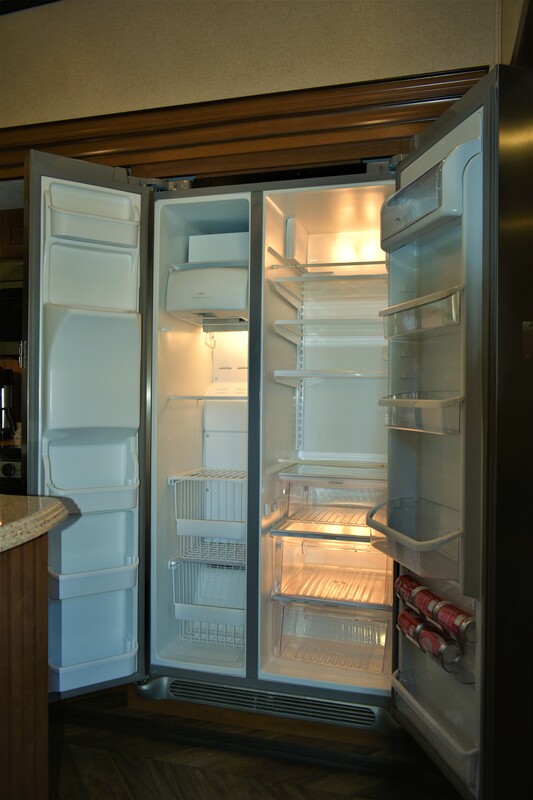 Residential refrigerators only run on 120V AC. You need to be somewhere that has electricity, utilize solar panels, or a generator. 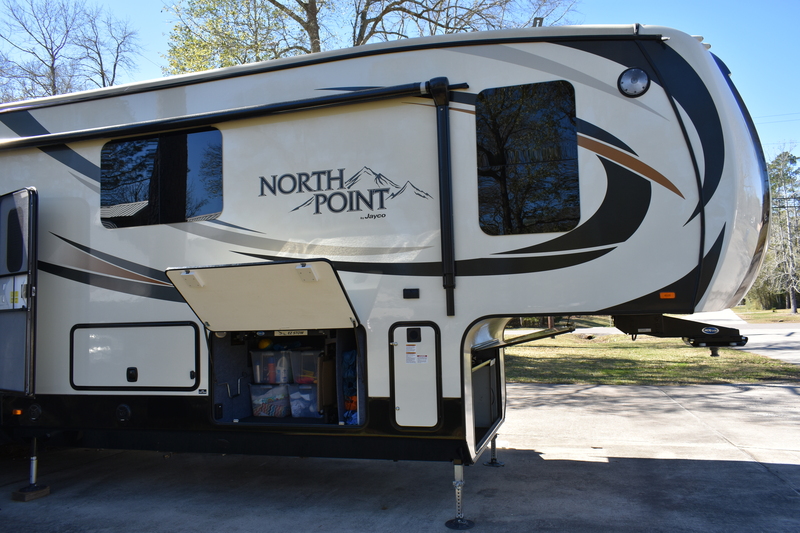 Deep cycle batteries and an inverter will only last long enough for traveling between campsites, it will not run for more than a day. It is crazy how many trailers you see with tiny doors on the outside storage compartments. How are you ever supposed to get anything useful in those? We live in part of the country that has high humidity. In such a humid climate, you are going to have mildew if you trailer is sitting outside and under trees. One thing we looked for was black molding around the door, windows, and compartments. We have all seen trailers with white vinyl trim that mildews and stains, and no amount of cleaning could ever make it look good again! 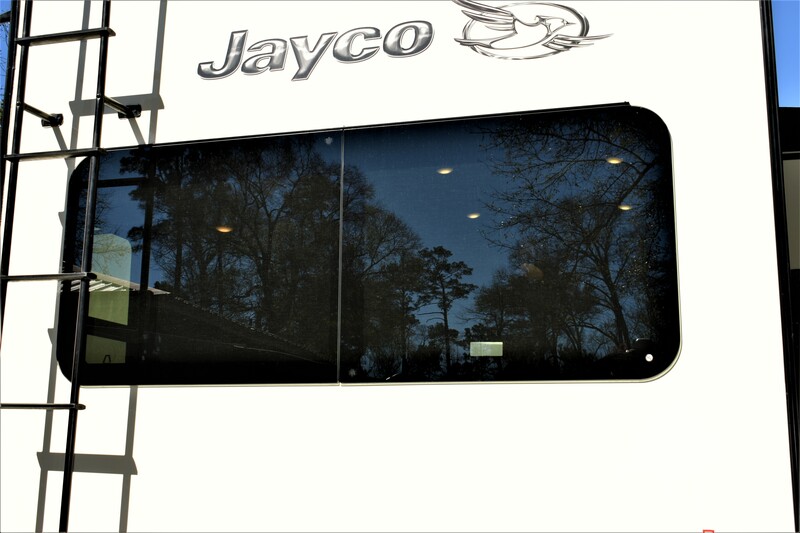 Our first RV had black molding for this reason, and we ended up getting frameless windows on our current RV and love them! Anybody want to wake up at 2:00 in the morning to put in the awning during the middle of a storm? We don’t want to do that ever again! Being able to just get up and push a button from inside your trailer is a huge plus. This option is well worth the extra money we paid when we bought our first RV. Our current RV came with this as standard equipment, and many RVs on the market today are also including this as standard. Most places we camp have trees, and Blaine was constantly having to get on the roof and clean off the leaves, branches, pine cones, etc. before we could put the slide in. Our first trailer did not have a roof ladder, and it was not built to support the installation of a ladder. 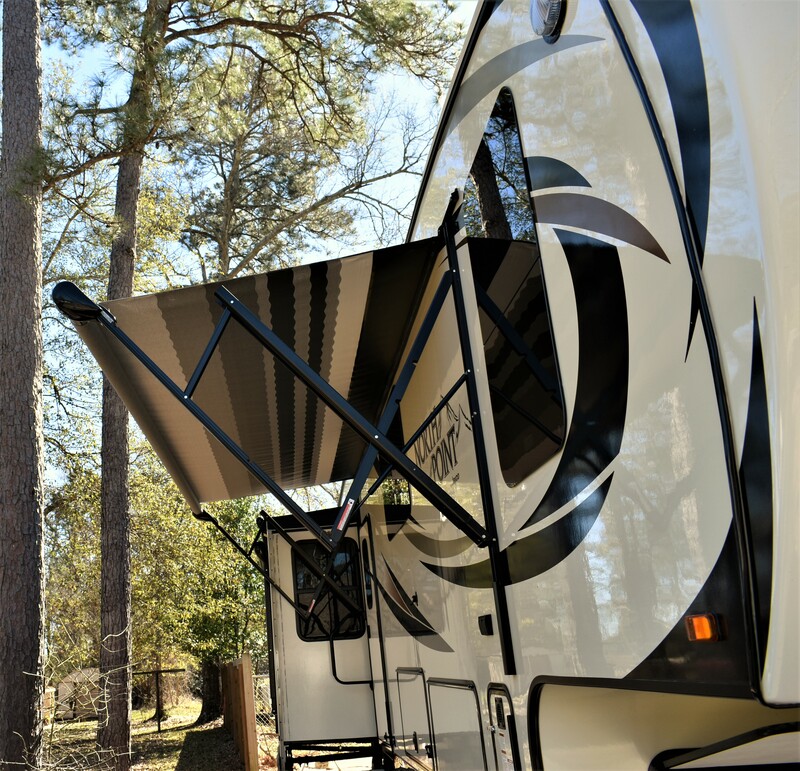 We eventually ended up installing a slide out awning on our first RV, so we didn’t have to strap a step ladder to the back bumper any longer. With the awnings, we just push a button and save the time and hassle of having to sweep off the slide out roof. Slide-out awnings also help cut down on heat from the sun shining on the roof of the slide-out. In our first trailer, we could feel the heat coming through the slide-out roof when we were parked in the sun. After we added the slide-out awning our A/C unit cooled the trailer much better. These can be added later, but if the trailer has them already that is a money and time saver. A ladder attached to the back of the trailer. It’s not a question of if you will need to get on the top of your trailer, but when. Who wants to use storage space to carry a ladder, or have it strapped to the back bumper of the trailer? We, and by we, I mean Blaine, have to get on the roof of our trailer all the time to clean or to check for damage from storms or low hanging limbs. Having a ladder already attached will save your storage space and is just more convenient. When camping, we do a lot of things that require us to get somewhat dirty. From swimming (beach or lake sand can make a trailer stink) to kids just being kids and getting dirty no matter where they are or what they are doing. An outdoor shower is just the thing needed to rinse off before sending the kids inside to get cleaned up. Our outdoor shower also gets used to wash items like ice chests, water shoes, or sandy inner tubes or pool inflatables. We also cook and eat outside while camping, so we carry a folding table and wash tubs, so we can wash our dishes outside. This works great for big pots and griddles that are too big for the kitchen sink. Just make sure you know what the campground rules are about washing dishes outside beforehand. It’s also more convenient when eating outside for everyone to wash their hands at the outdoor shower before dinner if everyone is already outside. Blaine has even used our outdoor shower to clean fish. The possible uses for this item are endless…just make sure to not break any campground rules. This is by no means an all inclusive list, or even one we feel everyone should have. Each of you will have different ideas of what things are important to you. Our hope is by sharing our list it will help you make yours. 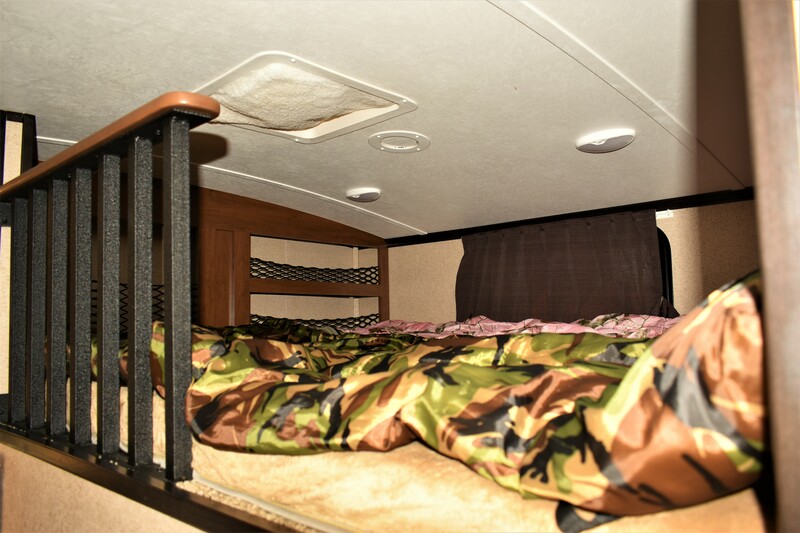 The reality is, after purchasing your first RV, or any after that, you will probably always find something you wish was different. Such is life! The goal is to get it as close to perfect as you can get for you and your family. Good luck and happy shopping!